The CHL horizontal loading system provides flexibility by opening, loading and sealing a case laying horizontally, thereby decreasing the footprint of the integrated loading system and accommodating a wider range of products. The CHL is integrated with the Combi HCE case erector and also features a sealer equipped with your choice of pressure sensitive tape or hot melt glue. Whether your product requires upstacking, downstacking, or progressive collation, the compact CHL is adaptable to your product and your floorspace requirements. 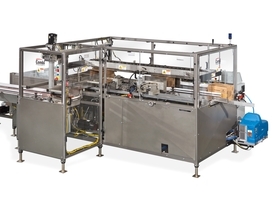 The horizontal loading solutions allow for many pack patterns and product sizes on the same machine and offers many collation methods for product grouping and orientation. Actual speed for a horizontal loading system can be determined after reviewing product and case samples. The horizontal loading system, shown in the videos below, is perfect for companies with limited floor space. The videos below illustrate the machine’s flexibility by case packing a multitude of products – from furnace filters to cookies.